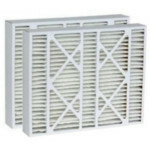 York AC Air Filter Replacements improve air quality by capturing dust, pollen and other contaminants. The York M0-1056 replacement perfect fit filter design allows more air to meet the filter media to better capture airborne contaminants. The York MU1625 replacement traps microscopic particles in a deep filter media. A continuous hydrophobic polyolefin fibers construction means durability while a larger surface media results in a longer filter life. The York M1-1056 replacement reduces the amount of airborne contaminants found in household air with a moisture and mold resistant structured density gradient media that holds an electret charge. The York 9183970 replacement has a deep filter media that resists tearing and mold growth. The FiltersFast Brand York MU2025 replacement has a deep filter media that resists tearing and mold growth. The York 9183940 replacement combines the strength of a continuous hydrophobic polyolefin fibers media and increased surface area to reduce the amount of airborne pollutants found in indoor air. The York P102-1620 replacement combines the strength of a continuous hydrophobic polyolefin fibers media and increased surface area to reduce the amount of airborne pollutants found in indoor air. The York M8-1056 replacement utilizes a high efficiency MERV 11 material idea for homes where pollutants are found in the form of dust, mites, pollen, mold spores, fungi, pet dander, cooking smoke, and more. The York MU1620 replacement combines the strength of a continuous hydrophobic polyolefin fibers media and increased surface area to reduce the amount of airborne pollutants found in indoor air. The York FS1620 replacement is the ideal filter for sufferers of respiratory problems that need protection from pollutants commonly found in the air of homes. The York 9183950 replacement is designed around a MERV11 media filter to capture atmospheric contaminants commonly found in household air. The York FS1625 replacement is an economical approach in the reduction of indoor dust, coal dust, mites, pollen, mold, pet dander, cooking smoke and more which can result in improved respiratory health.